Domex leads the fight against diseases caused by unsanitary toilets through the 1M Clean Toilets Movement. In celebration of World Toilet Day, Domex leads a toilet clean-up in East Avenue Medical Center, symbolizing their commitment in helping people, especially those who have been afflicted, to fight disease through clean toilets. To support the 1 Million Clean Toilets Movement and World Toilet Day, I pledge to properly clean my toilet, to protect my family from diseases caused by unsanitary toilets. This is me and Merilyn, my store assistant, doing the checkmark hand gesture. 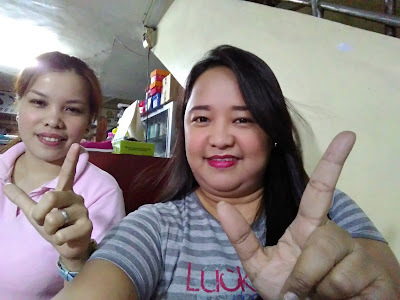 Post a photo of you and/or your loved one doing the check mark hand gesture using your/their left hand in Twitter, Instagram, or Facebook. Answer these questions: Who do you protect from disease-causing germs? Who inspires you to keep your toilet at home clean and germ-free? Tag us in your post. For Twitter/Instagram, it's @the24hourmommy and, for Facebook, it's The 24-Hour Mommy. Include the hashtags #WorldToiletDay2015, #1MCleanToilets, #The24HourMommyLovesDomex in your post. Deadline for posting is November 20, 2015, 11:59 PM (Philippine Time). I will be choosing 10 winners from the lot on November 21, 2015. Winners will have until December 15, 2015 to claim their prizes at 2F Zaragosa Bldg., 102 Gamboa St., Legaspi Village, Makati City 1229 Philippines. Easy as 1-2-3! What are you waiting for? Post your awesome photos now!